The other night, our guild went into the Wintergrasp Vault. I hadn't attempted the new 25man since he came out. When he first came out the adds were very tough to get down in time. Now it appears that it's pretty easy as long as dps pays attention and can target the right minion quickly enough. Outcome: Conqueror's Scourgestalker Handguards for a fellow hunter. Then we went back into Ulduar. We're in a mini-rebuilding mode for raiding. 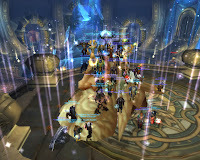 (For at least three raids, we struggled to put together 25. We're looking pretty good now.) We wiped a bunch but finally came together and downed the lazerpewpew bridge guy, Kologarn. Outcome: Giant's Bane for a fellow hunter. Side note: Last Thursday we had a pretty nice Ulduar-10 run and one-shotted a whole bunch of bosses. It really is amazing how much easier 10-man is over 25-man. 25man is really cramped and close quarters for a few fights. So anyway, after Kologarn it was not too late, but a little late to hit our heads on another boss. A bunch of raiders were tired so some people logged and a few of us went in on ten-man mode and downed FL and XT-002. Outcome: Gloves of Taut Grip and Pyrite Infuser for the only hunter in the raid.